The nine-story Development House has vertical open spaces for light and air flow. Renderings courtesy Waugh Thistleton. Click here to enlarge. Architecture firm Waugh Thistleton designed Development House, an office building in London’s Shoreditch district. The nine story, 90,000-sf complex will be made of wood. The timber will be a combination of cross-laminated timber (CLT) and glued laminated timber (glulam). Dezeen explains that glulam is made of several slices of wood layered and glued together, while CLT is similar, as it has wood layers arranged at right angles. CLT and glulam are stronger than regular wood. The Building Team said that building with wood minimizes time on site and reduces noise and waste during construction. The design calls for the building to be shaped into five quadrants, with vertical slices separating each glazed section. The voids will allow daylight and fresh air to reach the center of the building. Gardens can be placed in these spaces as well. 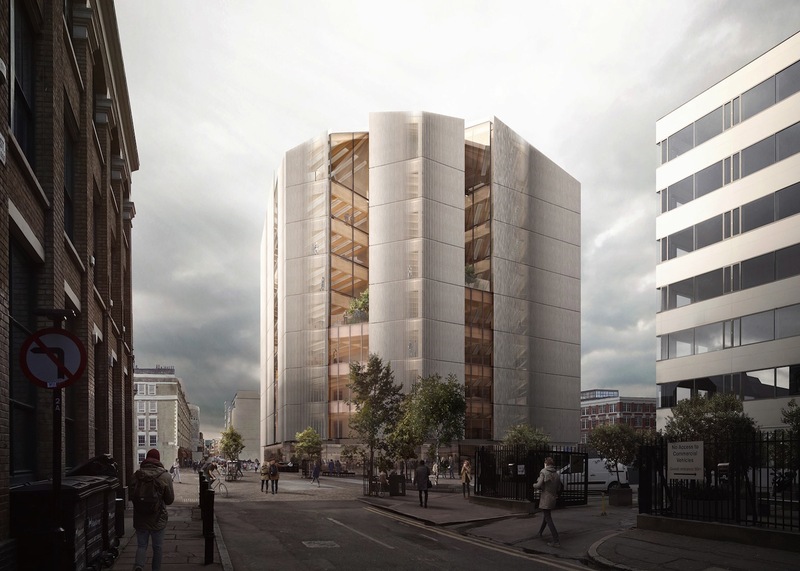 According to Inhabitat, Development House will be one of the tallest wood-framed structures in London. Waugh Thistleton has also designed Dalston Lane, a 10-story, 121-unit development that uses more than 3,000 cubic meters of timber, and the nine-story Murray Grove, which was the tallest modern timber residential building when it was built in 2009. Both of those London-based projects incorporated CLT. Development House. Click to enlarge.